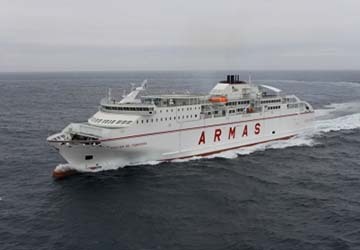 Volcan De Tamadaba was first introduced to the public as part of Naviera Armas' fleet in February 2007, quickly becoming a favourite vessel on the sailing from Gran Canaria to Fuerteventura. Up to 1000 people can board the ship at any one time, with the boat stretching to a length of 154 metres and travelling to a speed of 24.5 knots. Please Note: Whilst we have taken great care in making our Volcan De Tamadaba guide as accurate as possible, onboard facilities, services and entertainment may vary depending on the date and time of year that you travel, facilities mentioned may change without notification and ferry companies reserve the right to operate vessels other than those mentioned at time of booking without prior notification.